Are you ready for the holidays, but not quite prepared for the new year ahead? This is the ideal time to reflect and determine what your goals as a homeowner are in 2019 – and give yourself the tools to achieve them. The goal is long-term investment in your home over short-term, fleeting enjoyments, so get ready to think big. Refinance. Florida home values continue to climb, meaning that 2019 could be the year to apply for refinancing. With fixed mortgage rates hovering under 5%, you could be able to get some equity out of your home to pay for improvements or a much-needed vacation. Reboot. Always wanted an in-ground pool, a deck, or a lush tropical garden surrounding a gazebo? Make it a goal for 2019 to completely transform your outdoor living space and create a welcoming place for friends and family to enjoy. Remodel. Moving indoors, what do you like and dislike about your home? Plan that long put-off kitchen project, knock down a wall to add that en-suite bath to the master bedroom, or boost your property value with a smart-home upgrade. Reorganize. The advent of a new year provides a great opportunity to declutter. Toss things that aren’t useful to anyone, donate things that aren’t useful to you, and invest in organizers or shelving for the things you plan to keep. Take a look at your most used living spaces with a critical eye. Are your spaces for sleep and relaxation conducive to those activities? Maybe it’s time to move the home office out of the bedroom. Revisit. Check your annual expenses and find out what value you are receiving for your hard-earned cash. You might find a better deal on your home security monitoring, or find discounts on homeowners insurance after discussing your current policy with an agent. 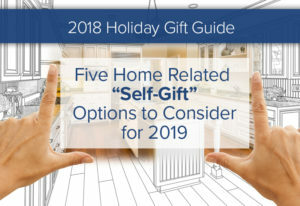 Choosing even one of these options can set you on the right track for the new year, and improve your home, your finances and your overall sense of well-being.